When the external Quinton-Scribner arteriovenous shunt was developed in 1960, and, a little later, the internal Brescia-Cimino arteriovenous fistula was developed as a vascular access for hemodialysis, thereby making possible regular dialysis therapy of chronic uremic patients, many nephrologists became surgeons, having learned the type of vascular surgery related to hemodialysis quite well. The same series of events occurred with regards to peritoneal dialysis with the introduction of the Tenckhoff catheter and the need for gaining a permanent access to the peritoneum for chronic ambulatory peritoneal dialysis (CAPD) therapy. With time, however, problems relating to vascular and peritoneal access have forced many nephrologists to give up their surgery; meanwhile, many surgeons have become quite expert in some sophisticated techniques relating to dial ysis (e. g., vessel grafting, prosthesis implantation, etc.). Today, whether or not involved in this type of surgery, both nephrologists and surgeons remain interested in knowing all available access devices for dialysis as well as the surgical techniques involved. However, all nephrologists involved in dialysis must know how to prevent or treat complications related to dialysis access. 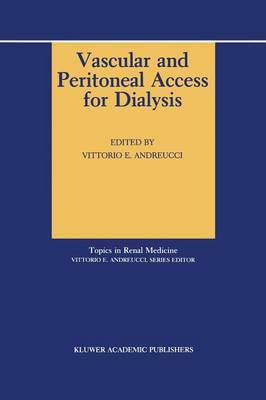 Thus, it appeared to me to be quite advisable to have a book in my series, Topics in Renal Medicine, dealing with vascular and peritoneal access for dialysis.